This is an amazing English story for kids to read. There was a big handsome magpie. He was always ashamed of living with other magpies. “How can a handsome magpie like me live with such ugly guys?” he wondered. So, one day, the handsome magpie went to the village of Eagles. “Great Eagle, would you kindly allow me to live with you?” he said to an eagle. After hearing the magpie’s request, the eagle examined him all over with his big and bright eyes. “What? Do you want to live with us? How do you think you can live with us? You don’t look like us. Your voice sounds different from ours. You impudent bird, get out of here right now!” said the eagle. Also, read The Foolish Bear. Image Source@ www.youtube.com. It seemed that the eagle was ready to pick the magpie with his sharp beak at once. The magpie escaped quickly and flew to another eagle. “What? Such an ugly magpie as you wants to live with such great eagles as us?” The second eagle drove away from the magpie with his dreaded wings. 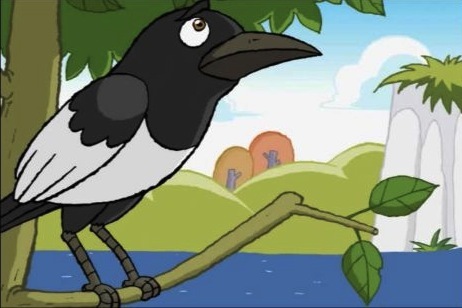 The smart-aleck magpie was depressed and shed tears. He had no choice but to return to his native place. “Pshaw! Why did you return imprudently after leaving us on the grounds that you hated to live with us? Do you think we’ll welcome you? Get out of here right now! ” said his friends. Even his friends angrily drove him away. At last the smart-aleck magpie lived alone until he died. Also, read The Foolish Rabbit.